What is KP for Kids? KP for Kids (Karate Pilates for Kids)is comprehensive karate program incorporating the core strengthening aspects of Pilates along with practical self-defense and meditation for children. KP for Kids is the vision of Sensei Amelia Sheftall, a fourth degree black belt in karate and has been a certified Pilates instructor for over 10 years. Sensei Amelia’s continued vision is to provide structured martial arts after school programs that include body awareness education for children. This includes weekly meditation practice to increase student’s coordination and focus in all that they do both inside and outside of KP for Kids class time. Benefits of KP for Kids? All of which lead to a healthier body and healthier mind. 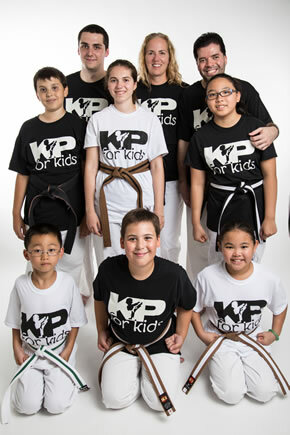 KP for Kids has the additional benefit of being a goal-oriented program with recognition for improvement and effort through a traditional karate belt system (white through black belt) and achievement badges. These elements create enthusiasm for students to remain dedicated and interested in the program. Students work harder to accomplish new belt levels and ability. The added bonus is that all of their other activities are positively impacted as a result! All types of athletes from dancers to hockey players have used Pilates worldwide. It is a tried and true method of strengthening the core body and in the process creating healthier, better balanced bodies that are less prone to injury. It is a series of ever challenging exercises that is based on Joseph Pilates’ 80-year-old total body conditioning system. Exercises like “the hundred”, roll-ups and shoulder circles are just a few examples of Pilates. Integrating Pilates into the karate program at KP for Kids or any other physical activity is a wonderful lifelong practice for the body. Working your powerhouse (center of your body between bottom ribs and top of pubic bone) increases your coordination, flexibility, strength and balance. All of these elements contribute to a healthy, toned and injury resistant body.